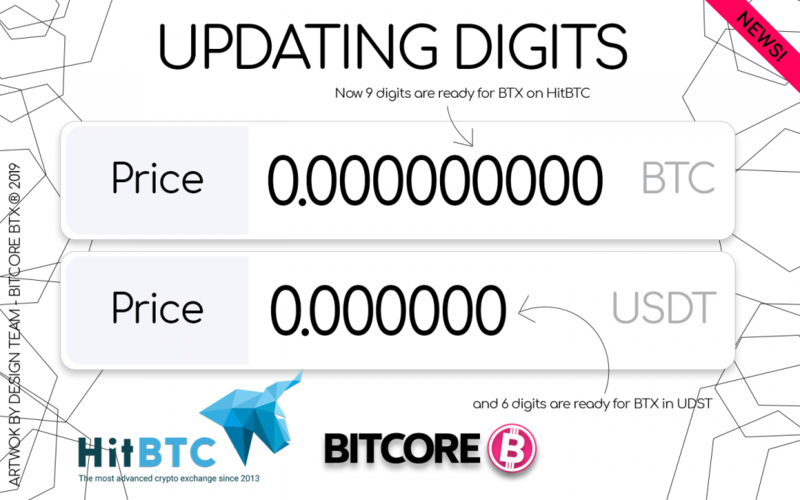 We are happy to announce that HitBTC increased the decimals from 6 to 9 for Bitcore BTX trading pairs. This will have a positive impact on trading and prevent the walls move quickly and possibly disappear. Because, the trading of Bitcore at HitBTC was happening only in 1000 satoshi increments: you could sell at 0.000081 BTC or buy at 0.000082 BTC. Moreover, other exchanges are trading BTX with 8 decimals, which was opening the coin to arbitrage and slowing its growth. Investors were discouraged to enter a BTX market with such a volatility in price. Finally, HitBTC solved this issue to allow BTX traders to resume their trading, increasing liquidity and volume.